Mikey Drennan up against Roberto Lopes of Shamrock Rovers earlier in the season. 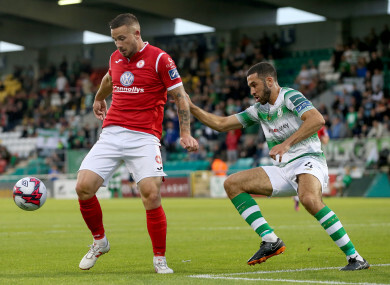 SLIGO ROVERS FINISHED a disappointing season in style as they saw off Shamrock Rovers 2-0 at The Showgrounds, sealing a seventh-place finish as a result of Derry’s heavy defeat to St Patrick’s Athletic. Mikey Drennan’s first-half stunner was added to by John Mahon in the second-half, for a big victory for Sligo. The hosts just announced their new manager Liam Buckley earlier in the day, with interim manager Brian Dorrian taking charge of his last game at the helm of the Bit O’Red. Sligo’s draw against Bohemian on Monday night, combined with Derry’s defeat to Bray on the same night meant that just three points separated 7th and 8th coming into the final game of the season. Given Sligo’s struggles all year, a seventh-place finish would be seen as an achievement of some sort. Stephen Bradley’s men had already confirmed a 3rd place finish for this season before tonight. But the Dubliners started the game strongest, with Mitchell Beeney forced into a decent save with just three minutes on the clock as Gary Shaw somehow forced his way down the left hand side before shooting at goal. Dan Carr’s shot from distance was deflected by John Mahon, before Dylan Watts’ powerful drive just clipped the crossbar. The Hoops were certainly looking the most likely to open the scoring, but the hosts did so in stunning fashion with 38 minutes on the clock. David Cawley’s cross from the left game towards Drennan, and he bravely chose to go for the bicycle kick option, smashing past Alan Mannus to give his side the lead with his eighth of the season. Sligo looked dangerous again after the re-start, and they doubled their lead on 55 minutes when a glorious free-kick by Adam Wixted was nodded past Mannus by local boy John Mahon, to make it 2-0 to the hosts. The Dubliners fought hard in the last 30 minutes in an attempt to get something from the game, with Watts’ free-kick forced wide by Beeney before Joel Coustrain sent his attempt just wide of the post. Stephen Bradley’s side were second best for the majority of the game, but Sligo’s fourth win of the season at home has finished off a disappointing season on a positive note. SLIGO ROVERS: Mitchell Beeney; Kyle Callan-McFadden (Adam Wixted, 46), Seamus Sharkey, John Mahon, Patrick McClean; Liam Kerrigan, Niall Morahan (Lewis Morrison, 92), David Cawley (Kris Twardek, 75), Jack Keaney; Mikey Drennan, Caolan McAleer. SHAMROCK ROVERS: Alan Mannus; Ethan Boyle (Sean Kavanagh, 50), Lee Grace, Joey O’Brien, Sam Bone; Brandon Miele (Joel Coustrain, 46), Greg Bolger, Dylan Watts, Ronan Finn, Dan Carr; Gary Shaw (Sean Boyd, 66). Email “Drennan scores stunning goal against former employers as Sligo down Hoops”. Feedback on “Drennan scores stunning goal against former employers as Sligo down Hoops”.